•The one true Creator God of the Old and New Testaments, and His Son Jesus Christ, God incarnate, who was born of the virgin Mary, died on the cross to save the world from sin, was buried, rose bodily from the grave, ascended into heaven, and will come again to judge the living and the dead, and in God’s Holy Spirit, through whom the gospel was unfolded and men and women are saved. •The Holy Scriptures, the inspired word of God. •Fulfilling Christ’s Great Commission, which calls us to go and make disciples of all nations by baptizing them and teaching them to obey everything Christ commands; •The unity of Christ’s Church for the sake of world evangelism. Judah and Khaw Tangshing grew up in Putao, in the northern most area of Myanmar. Judah accepted Christ at the age of 16 and then attended and graduated from the University of Mandalay in Myanmar. He put himself through school by working as a gold miner in the jungles of Myanmar, where he contracted Malaria. While attending the University he was disturbed by questions from his Buddhist school mates who questioned who God was and who created him. Judah wanted desperately to be able to answer these questions and many more, but did not feel equipped. Judah felt God calling him to become a missionary to the many unreached people in his country (92% are Buddhist). Through God’s grace and Judah’s passion and ability to learn, he was able to come to the United States and attend Florida Christian College in 1995, to receive Christian Leadership training. 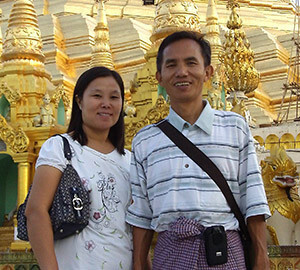 He then returned to Myanmar where he and his wife Khaw moved to the town of Wireless outside of Yangon to dedicate themselves to full time ministry. Through their faithfulness and God’s blessing, they have seen their small house church ministry grow from a few families in 1997, to now include orphanages, church plants, a preschool, Bible college sponsorships, and evangelist support. Mission Statement: Mission Myanmar Inc. is a non-profit 501c3 organization that strives to love people, share the Gospel of Christ, and transform lives in Myanmar. Support: 100% of the support you give to Mission Myanmar goes to Myanmar. Real Life Church in Clermont, FL, oversees all US based administration duties for Mission Myanmar and absorbs all administrative costs.